I don’t know about you, but when I heard about Pantone’s 2017 color of the year, I was pumped. Seriously, I was like way excited. Maybe it was because the past few years I have been less than thrilled with the selection. Maybe it was because I loved using that color and already had ideas. Or maybe it was because I placed a bet in October on what the color would be and won. Whatever the reason, I was (and am) super happy that Pantone’s 2017 Color of the Year is “greenery”. Yes, that is a color and you can read all about it on Pantone’s official website right here. Greenery symbolizes new beginnings in the same way the green leaves in spring time do. I love using green in wedding and event designs because there is so much you can do. [tweetshare tweet=”There is a greenery for every bride and all styles of weddings.” username=”RothweilerEvent”] In fact, it’s more than just a color. It’s a feeling. In this blog I am sharing a few ways I have used Pantone’s 2017 Color of the Year in the hopes to inspire you for your wedding day. Don’t forget to pin the photos you love the most and comment the ways you’ll incorporate Pantone 2017 Color of the Year! Everyone’s seen Fern Gully right? Am I like super old and weird right now? If you don’t know what I’m talking about, Fern Gully was a movie that took place in the rainforest. It was about deforestation and other depressing stuff, but the colors were bold and magical and (spoiler alert) the main characters lived happily ever after. The whole wedding design from the beautiful colors to the heavy amount of natural greens we used reminded me of those beautiful colors from Fern Gully. The bride had a vision of hanging greens for the ceremony backdrop, and our florist created the best frame for their first married kiss. These greens were a mix of bright and deep shades not unlike the leaves in spring that inspired Pantone’s 2017 Color of the Year. 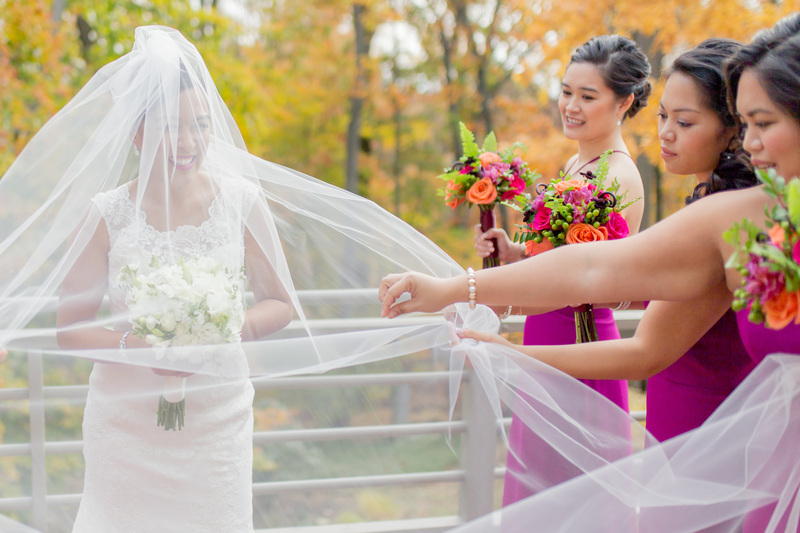 Putting aside the pinks, reds and oranges that made up the rest of the wedding colors and just using green for the ceremony made the space feel more intimate. There were no distractions and when the bride and groom became man and wife, it was a serene and beautiful moment. If it hasn’t become obvious yet, I am a big fan of greenery used as garland. Don’t get my wrong, I love green as a color, but my favorite way to make it work for almost any wedding is to keep it as a backdrop. That doesn’t mean it has to literally hang in the back, but more so that it supports the rest of the design. This farm location had a barn on site and whenever I see a banister, I feel compelled to dress it up. I totally blame “Father of the Bride” for this unhealthy obsession I have. 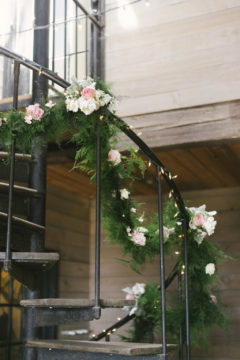 Soft and romantic, the green garland we used here was draped around the spiral banister from top to bottom. Like the ceremony site above, it was important to create a look as if the greenery just appeared there, naturally. As if it sprouted from the iron banister magically because that’s what Pantone’s 2017 Color of the Year does. The final touch here was to incorporate the other wedding flowers, so we pinned everything together with some pink roses and dusty miller. Much like a banister, if there is a mantle at a wedding location, you will find me adding “we woke up like this” style florals to it. 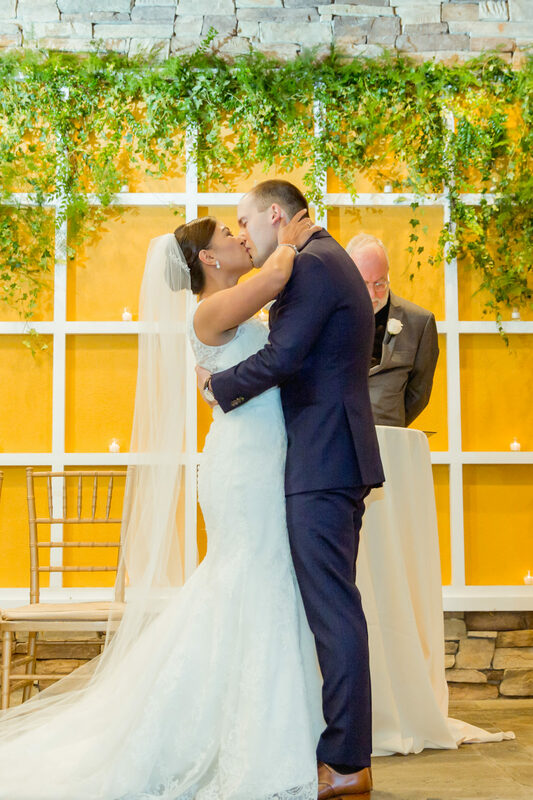 Mantles are more than shelves for photos and many are ceremony backdrops. As a designer, I like to incorporate the design into every corner of the space, and this is a big corner. 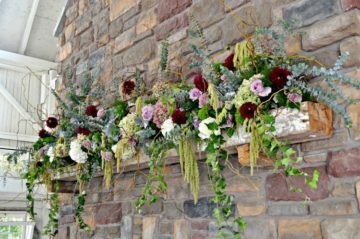 There are countless ways to dress up a mantle at your wedding, but it’s hard to do without greenery. 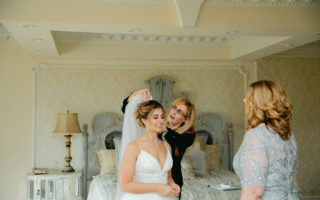 This picture is from a wedding venue with multiple mantles. In fact, you can see all the gorgeous details here. Each mantle was different, but they all used the greenery found in the centerpieces to tie the look together. My favorites here were the hanging amaranthus and the eucalyptus because they added dimension to the piece and still looked formal. We all know that long tables are a hot trend and they have been for a few years now. 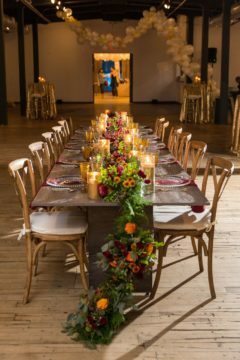 These gorgeous farmhouse tables can cost a pretty penny if your venue doesn’t already have them included. If you’re lucky enough to get your hands on these without robbing a bank (seriously, they ain’t cheap), then greenery garland is a must. This table was part of our design for The Knot Market Mixer last Fall. My favorite part about designing this event is being able to create whatever I’m dreaming of. In other words, I got to do what I wanted and what designer doesn’t love that? I wanted to create a warm and inviting tablescape and have greenery be the base of the design. Working with my florist, the garland worked as an anchor for the rest of the flowers and draped down to the floor. I’d recommend using greenery like this to any bride worried that her guests won’t see over tall centerpieces. The garden where this wedding took place was the inspiration for the greenery found in the centerpieces. Pantone’s 2017 Color of the Year is all about spring and clean starts, and this centerpiece is just that. Besides the obvious greenery pieces (you know, the green leaves), there are more subtle ones as well. While the only two colors used were white and green, that didn’t mean green leaves and white flowers only. A popular flower for centerpieces (but not for bouquets so don’t please) is hydrangea. Hydrangea comes in a bunch of colors including white and…wait for it…green! The clean look of the clear glass vase and candleholders with the greenery and white made this garden wedding the picture of spring….even if it took place in the summer. So, like, let’s all take a minute to recognize that not every piece of wedding décor is going to be at eye level. It doesn’t need to be at eye level and in fact, eye levels are different. Not that you’re inviting a bunch of NBA players to your wedding (or maybe you are and I should be planning it…) but creating designs from the floor to the ceiling makes an impact. Signage is a huge trend and it’s not just limited to chalkboard and aisles. 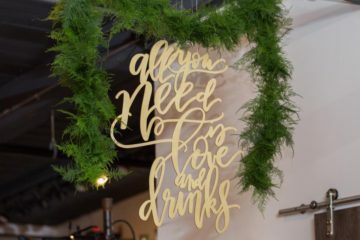 This lasercut sign is from our event with The Knot and is hung from fishing line. Really strong could rope in Jaws, fishing line. If you’re not onto how I work just yet, I like to make my designs appear organic. This is probably another reason why I am in love with Pantone’s 2017 Color of the Year. For this sign (and three others), I worked with my florist and asked them to drape greenery in a deconstructed way. I mean, it totally looks like the sign grew out of the ceiling. Score! 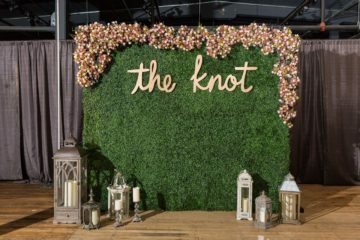 The floral wall is something that is popping up all over Pinterest, and we worked with Once Wed Walls to create this one for The Knot Market Mixer. Since I have been obsessed with greenery long before it was the Pantone 2017 Color of the Year, I wanted one using green as the base. The top was covered in more greenery and pops of pinks, oranges and cream flowers to match the rest of the room. These walls are, bottom line, really awesome. It was a natural backdrop for photos all night and everyone was talking about it. A great alternative to a blank photobooth backdrop (or a photobooth in general) is using one of these walls. Since this can be a custom piece, the wall can be made to fit like a backdrop for people and as small as a backdrop for your wedding cake. If you’re on the greenery bandwagon with me (though I’ve been driving it since like 2007), you can keep a natural look using boxwood like this. 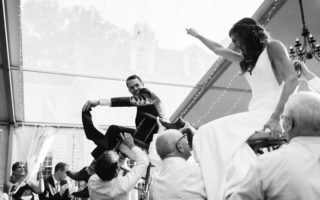 If you’re the bride that runs from basic bling and marble floors as fast as I do, then you’re probably considering a farm for your wedding location. Mega points to you for not being lame! More points if you find a farm with animals. This final way to use Pantone’s 2017 Color of the Year (though there are plenty more) involves a horse. 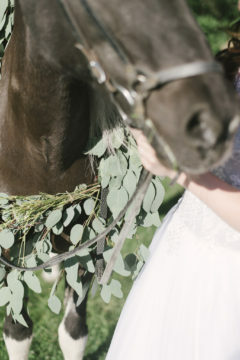 We used an Icelandic horse on this farm to drape a eucalyptus wreath around and create total greenery magic. You could easily do this design on other animals including dogs, goats and alpacas too. This wreath was created on site, so it’s important to make sure your florist will have the time they need on the wedding day. You don’t have to be on a farm to get the most out of Pantone’s 2017 Color of the Year. 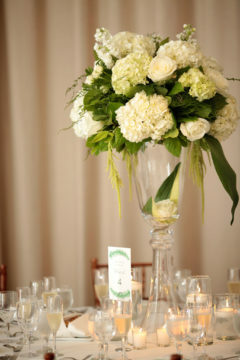 The bright green color will bring your centerpieces to life whether you choose tall or low runners. No matter how you use greenery in your wedding design, remember that the color represents new beginnings. If that’s not a good enough reason to use it on your first day as a married couple, then I’m not sure what is! What do you think of greenery? Will you use it for your wedding? 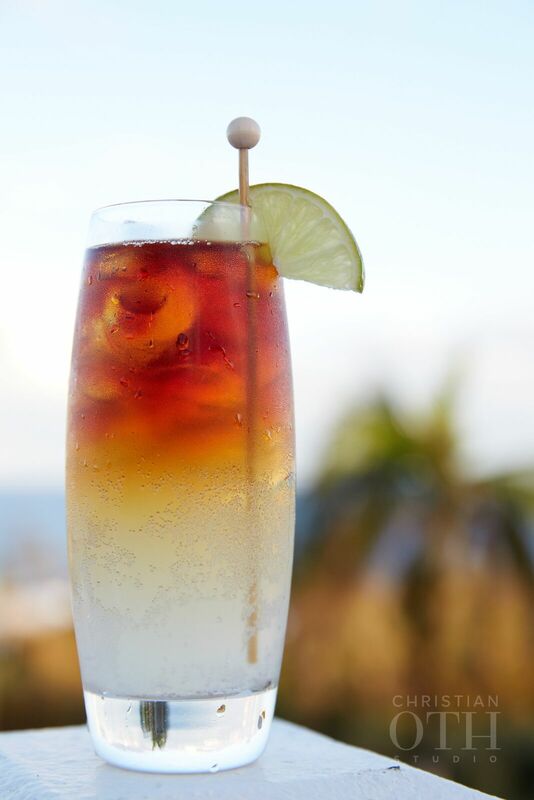 Share in the comments below your favorite idea or if you have one that we didn’t mention!